We started our Halloween off with carving pumpkins. While starting the process of gutting them, we thought to ourselves what we could do to promote our sustainable lifestyle. Christa decided to carve the recycling logo onto her pumpkin, which we had displayed for all the trick or treaters on Halloween. We also cooked the pumpkin seeds we had to reduce our waste. Christa and I were home alone for the weekend and decided to become proactive. We started feeling guilty that we weren’t doing enough. On our snow day, we planned and took action. 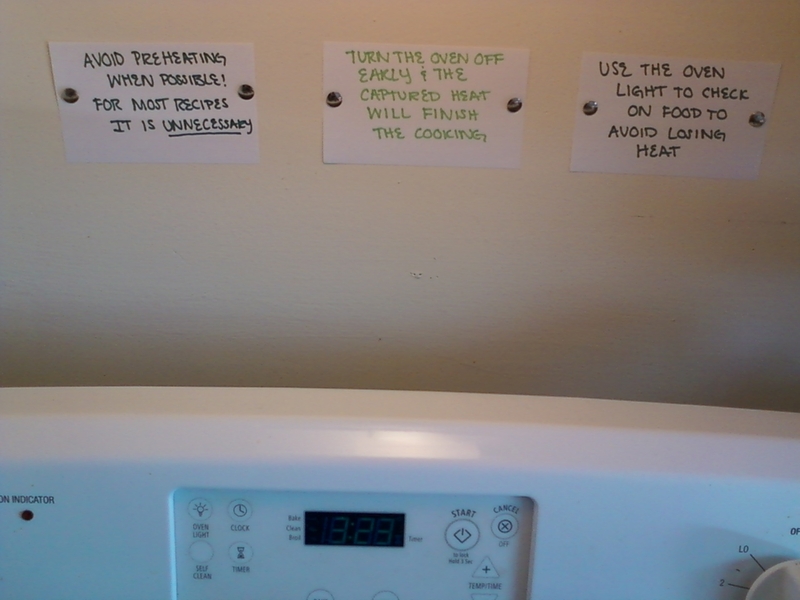 We began writing index cards of facts and reminders to post around the apartment. These reminders are for us as well as our guests. A lot of the time we forget to unplug something or throw something away which can actually be recycled. Now, with these reminders to guide us, we feel we will be able to make a bigger difference. We also looked up cleaning alternatives. Many products that we had under the sink are toxic. All of these products are non point sources of pollution. We have no way of telling directly where these pollutants are coming from, but they get into our water systems and can pollute rivers and streams. We wanted to cut down on our own addition to non point pollution so we purchased baking soda and vinegar. Baking soda can be used to clean and deodorize. You can use it in the kitchen to clean microwaves, refrigerators, sinks, counters, pots, pans, cutting boards, and food containers. You can add it to your laundry to help it smell cleaner and fresher. You can also use baking soda in the bathroom to remove dirt from tile, tubs, toilets, showers, sinks, floors and counters. Vinegar and lemon juice can be used to cut grease. These products can eliminate the use of bleach, Clorox wipes, Lysol, Comet and other harsh products that are toxic to our environments AND are more expensive! A four pound box of baking soda only costs $1.99 at Market Basket and a 32 oz bottle of vinegar only cost 79 cents! We have an old bottle of Fantastik cleaner priced at $3.19, which is more expensive than baking soda and vinegar combined. The bottle also has statements on it such as, “Hazard to humans and domestic animals: Caution”. Which would you rather use to clean your household? Sustainability TipsMore Sustainability Advice from E6from E6Happy Sustainable Halloween from E6!